How should one choose the best restaurant to eat in? Can one really make money at gambling? Or predict the future? 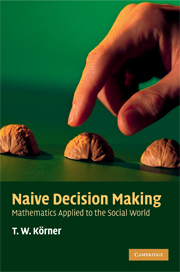 Naive Decision Making presents the mathematical basis for making decisions where the outcome may be uncertain or the interests of others have to taken into consideration. Professor Körner takes the reader on an enjoyable journey through many aspects of mathematical decision making, with pithy observations, anecdotes and quotations. Topics include probability, statistics, Arrow's theorem, Game Theory and Nash equilibrium. Readers will also gain a great deal of insight into mathematics in general and the role it can play within society. Intended for those with elementary calculus, this book is ideal as a supplementary text for undergraduate courses in probability, game theory and decision making. Engaging and intriguing, it will also appeal to all those of a mathematical mind. To aid understanding, many exercises are included, with solutions available online.